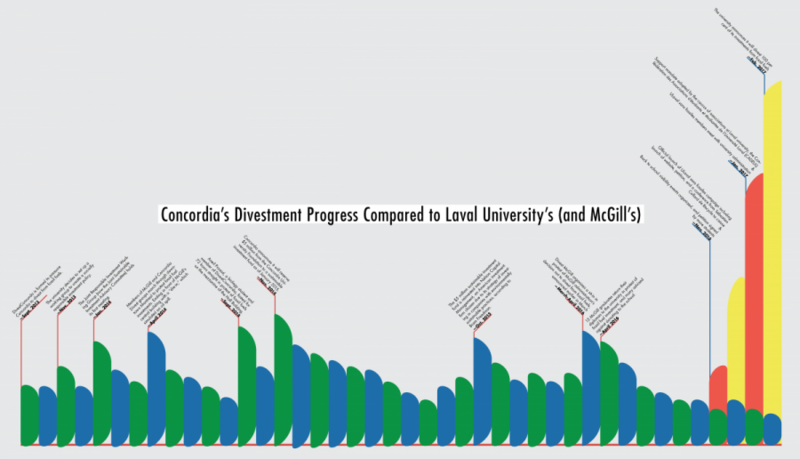 How Does Concordia Compare on the Path to Fossil Fuel Divestment? Of its total $100 million used for investments, just five per cent of Concordia’s endowment fund is dedicated to sustainable causes. Concordia’s committee in charge of advising just where this $5 million should go met on Feb. 16. The day before, Laval University announced it would divest 100 per cent of its investments from fossil fuels, becoming the first in Canada to make this commitment. Fossil fuel divestment is the removal of any stocks, bonds, or investments in the fossil fuel industry, in an attempt to hold the industry accountable for its impact on climate change. Laval University’s decision came as a direct result of a campaign similar to DivestConcordia, called ULaval sans fossiles. Both organizations have been calling on their respective universities to remove all their investments in the fossil fuel industry. 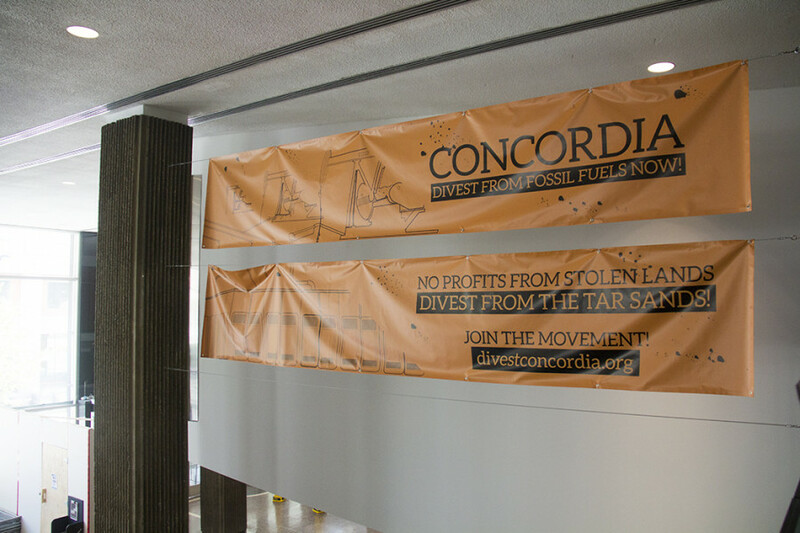 The difference between the two is that DivestConcordia has been around since September of 2013—ULaval sans fossiles formed only four months ago, in November 2016. According to Alice-Anne Simard, co-spokesperson for ULaval sans fossiles, their divest campaign followed the same formula as most. “Our campaign looks like any other,” Simard said. The group made stickers and pins, created a website and Facebook page, and rapidly gained a huge following. The reason it worked so quickly, she said, was because of the openness of Laval University’s administration to the idea. After the organization’s first negotiation with the university on Jan. 29, it was decided that they would set out on a five year plan to fully divest from fossil fuels. Two weeks later, the decision was announced to the public. “The only difference [between our campaign and other university divest campaigns] is really that our university saw the opportunity to be a leader in this area,” Simard said. DivestConcordia members are excited about ULaval sans fossiles’ success, according to their spokesperson Tabea Vischer. “It will definitely have an effect on Concordia’s decision to divest,” Vischer wrote in a message, adding that the campaign still has a long way to go. Laval University’s decision added (fossil-free) fuel to the campaign’s fire. Vischer said DivestConcordia is prepared to push even harder for divestment this semester, and will not stop until the university commits. As a response to students’ call for divestment, the Concordia University Foundation carved out $5 million to invest in what are called impact investments. These involve making intentional decisions about investing in areas that will have social impacts, according to Bram Freedman, Concordia’s VP Advancement and External Relations, and President of the CUF’s board. The CUF is a separate entity from the university. Its board decides where donated money and other funds are invested, and its goal is to generate returns on these investments. These returns are used to fund student bursaries, scholarships and research. This $5 million is subject to recommendations from the Joint Sustainable Investment Advisory Committee. The committee members are mandated to advise their respective governing bodies on socially and environmentally responsible investment opportunities, but is not a legislative body that can make decisions. So far, no recommendations have been made to the CUF’s investment committee, who will decide on how much money goes where—in stocks, bonds, or equities. The only guarantee for the $5 million for now is that it will not be invested in fossil fuels, tobacco or arms. The decision to use the $5 million for impact investing happened in fall 2014, and JSIAC formed soon after. The committee includes a member of the Graduate Student Associ ation, a faculty member, a part-time faculty member, and some members of the CUF board. Vischer, representing DivestConcordia, and Lucinda Marshall-Kiparissis, the Concordia Student Union’s General Coordinator, also sit on the committee. The committee also hired a graduate student to assist with research on sustainable investments. Concordia is the first university in Canada to create this type of fund, according to Freedman. In October 2016, the rate of return for the $5 million was 3.92 per cent. He added that this rate of return has been equal or better than the CUF’s other investments. Freedman said that since the $5 million fund was set aside, he estimates about five to ten per cent of the CUF’s investments are in fossil fuels. It is difficult to track how much and where exactly the invested money ends up, because it’s managed by 11 different investment firms, all of which have pooled funds in a variety of stocks and bonds. There are no detailed breakdowns of the CUF’s investments, and in order to figure this out, a specialized firm would need to be hired to contact all their different investment managers and compile a report, Freedmantold The Link in October. No action has been made on this front, as the CUF has been focusing on discussing sustainable investment, according to Freedman. He said no money or resources have been dedicated so far, but he anticipates that this will probably happen at some point in the future. “If we wanted to find out, that would cost money, because we’d have to look at all of their holdings and pull out ours, and figure out which company is what and so on,” Freedman said. JSIAC’s three meetings since June have mainly focused on education and training. The committee has seen presentations of examples of impact investing, including the CSU’s sustainable housing project. “They’ve been interesting meetings,” said Marshall-Kiparissis. But she said she and other members of the committee are looking forward to actually making recommendations, which they should be getting to in the coming meetings. She added that she believes the committee is now moving to a process where the advisory committee can fulfill the advisory part of its mandate. Marshall-Kiparissis said she hopes Concordia can borrow some of Laval University’s fire when it comes to fossil fuel divestment. Freedman argues that the creation of JSIAC and the $5 million fund is along the same path as Laval University’s total divestment from fossil fuels. “We’ve looked at this $5 million as a pilot project. So far the pilot project has been positive,” he said, adding that he is proud, and all Concordians should be proud that Concordia was the first university in Canada to take this step. However, Vischer said that at JSIAC’s Feb. 16 meeting, Freedman said it was unlikely all JSIAC’s members would agree that full divestment from fossil fuels would be one of the committee’s recommentations to the CUF. She added that Freedman also said JSIAC’s discussions would be more fruitful if media were not involved. “I fully understand the impatience of our friends at DivestConcordia, I get it,” Freedman told The Link, adding that compared to other institutions, he finds Concordia is moving rapidly and making good progress. “I don’t think these campaigns are going to be appeased by middle grounds,” said Marshall-Kiparissis of DivestConcordia’s efforts. She added that she hopes Concordia will see Laval’s divestment as a model to push closer to, rather than trying to appease the campaign by committing to minimal sustainable investments. While she applauds Concordia for creating the $5 million sustainable investment fund, her role as undergraduate representative on JSIAC mandates Marshall-Kiparissis to support full divestment. This is because the undergraduate student body voted in favour of divestment in a referendum in November.